Vineyards situation : Located just to the south of Dijon, Fixin is one of the first communal AC which start the long chain of 30 villages making up the Côte de Nuits and the Côte de Beaune. Its altitude varies from 270 to 360 m and its gentle slopes face due east. The soils are limestone containing a few traces of marl. 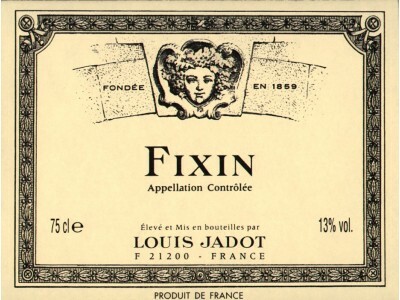 Characteristics : Louis Jadot produces a colourful and strong Fixin. The structure is predominantly tannic. With excellent acidity, they preserve a solidity and structure which enables them to be in the cellar a good few years. Wine making : Fermented in vats for about 4 weeks the wine is then put into oak barrels for 15 months ageing before bottling. strong, and traditional Burgundy cooking suits them perfectly : chicken in wine, beef braised and stewed in red wine, hare, game, traditional cheeses. Preservation : Kept in good conditions with good temperature and humidity, this Fixin is able to age 5 to 8 years.